Last week I went up (over?) to Washougal to look for the reported Red-naped Sapsucker. 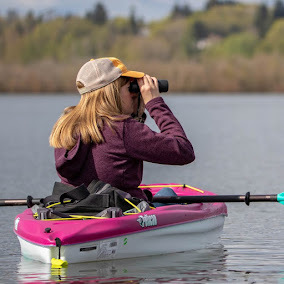 It was being seen at a park along the Columbia River that I had been to before, so I figured it would be a good combo of tiring the dogs and maybe seeing a new bird. It took me an hour and a half before I finally felt confident I had found it. Unfortunately it was near the top of a very tall tree. The second annoying thing? Everyone else who went looking for the bird seemed to find it within five minutes, about ten feet from the ground. Whatever, at least the dogs were tired. Yesterday morning I wanted to work on my motorless list so I rode my bike out to Broughton Beach just before sunrise. Eh, not bad. The last bird I added to my motorless list was the Black-crowned Night-Heron. Supposedly there are a couple roosting in their usual spot along the river, but I could only find one. They are pretty adorable when sitting in trees. I was afraid I was about to witness a gory alligator attack down below this tree on the dock . Luckily it never happened. Good times! Congratulations on the five new birds! I would love to see a Red-naped Woodpecker. At least you caught a few glimpses. Love the formation of scaups and Barrow's Goldeneye. Fantastic! Jen, what great birds and day! I love your photos. Congrats on adding 5 new birds to your list. I would love to see the Barrows Goldeneye and Rednaped Sapsucker. The photos with the ducks in formation is cool, how did you get them to do that? LOL! That night-heron is so freakin' cute! He/she looks all pudgy and adorable! BIKING before sunrise is illegal isn't it? You're amazing!! Love the list the golden eye is awesome and you got the sapsucker too. LOL at that formation it looks like they really worked on getting the spacing just right...good job! !